The special Tavern Brawl for this year's Winter Veil has you exchanging decks with your opponent. In this Brawl, you pick a class and then create a deck with 20 minions, while you will be gifted 10 random spells. 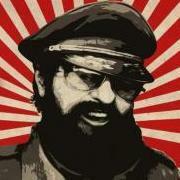 In the beginning of the game, after the mulligan, you will swap decks with your opponent. 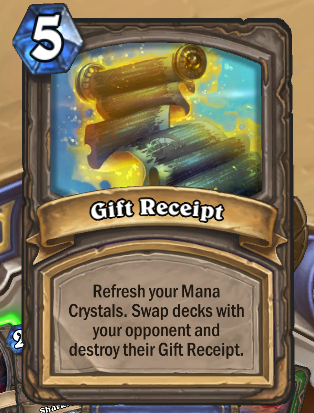 Each of you will get a 5-mana spell called "Gift Receipt" that refreshes your Mana Crystals, allows you to swap back decks with your opponent and destroys the opponent's Gift Receipt. Both heroes will also have 20 Health. There are many different ways you can approach this Tavern Brawl. The obvious one is to make a garbage deck, but this can put you at a disadvantage as well in the late game. You can also fill your deck with big threats that your opponent can't play in the first turns and after getting your deck back, you will then have enough Mana to play these cards. Another option is to experiment with Discardlock: playing Soulwarden will return the Receipt to your hand, if your opponent played his/her Receipt first and forced you to discard yours, and discard minions like Howlfiend will definitely not be desirable from your opponent. Whizbang the Wonderful works quite interestingly in this Brawl. Whether intended or not, you will actually start with 30 health and a premade deck recipe (so no 10 random spells). The expressions on those faces... just wonderful. I wouldn't have even played the 1 game had I noticed there's no card pack reward. FYI, the Whizbang bug was fixed in yesterdays patch as well. 1x Soulwarden (KEEP) the only good card of the whole deck just hope the enemy not get her and use her when they take back their deck to deny their deck and lock them with the horrible one. You can win in countless ways like using dirty rat to drop a bomb squad from their hand or kill them with their own cards in Priest Style. If you use Soulwarden prepare to laugh hard when they drop all the ancient watchers and co. hoping to find a decent card in the deck. I like that one too. When I got the card back for finishing a run of the new solo campaign I noticed it was missing from my card back collection, even after shutting down and restarting. 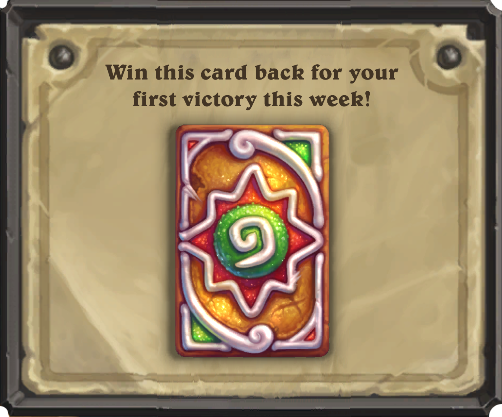 Then it came back after I got the tavern brawl card back. Weird. I started the brawl with warlock and a load of discard minions and other bad things like millhouse. Won a few but it was bad (3/8 discard 2 is pretty good for your opponent when you are holding a bunch of 0 attack minions). Then tried a mage with all 0 attack minions which was also pretty bad. Lost interest and then got a win-three-brawls quest a few days later, so tried a druid with nothing but 10 mana minions apart from a few 9s needed to complete the 20. Won the three and then carried on and went on what must be my longest ever hearthstone win streak (noticed at some point I was on 6 wins but not sure when that was, so was 18 minimum, maybe a few more). Was worried druid wasn’t the best pick (opponent may draw into ramp and get to big minions first though ramp didn’t help them the few times it happened) but seemed to work well, (mulliganing for spells). Quick quiz: what single card ended the run in utterly devastating manner?